We've started to bolt together the frame assembly. 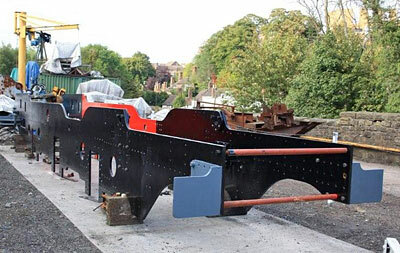 The first two stretchers are in situ, including the steam brake cylinder support bracket, plus the buffer beam gussets are temporarily bolted in place pending marking for drilling to take the beams. 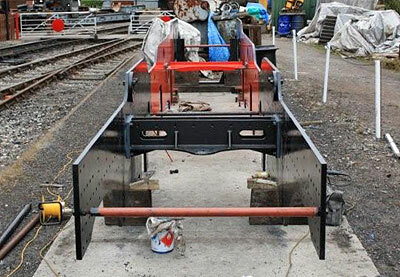 We are hoping to have buffer beams themselves in place ready for the Gala weekend. There are two more horizontal stretchers awaiting the machining of edges prior to fitting into the frames. 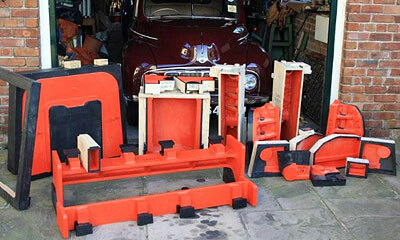 And we are expecting a quote from Dave Hewson in Sheffield for the fabrication of two vertical stretchers. Whilst all the activity of attaching bits to the frames has been going on, Phil Harvey has completed the fabrication of the hind radial arm support stretcher and has begun the fabrication of the front one. We have some holes to drill in these afterwards plus the machining of edges to size to fit between the frames. Phil Harvey, the Lloyd's Coded Welder who is working on 82045 with us, could make good use of additional welding gear. Has anyone got a portable petrol-engined welding set that they would be prepared to donate, please? Preferably 200+ amps, even one needing some attention. Please get in touch with Tony if you think you can help. We would very much like to make contact with a small number of people who have been contributing by standing order, but for whom we have no address. Some are already overdue for membership of the Fund, and we are anxious to acknowledge this and also to thank all those concerned for their support. Please get in touch with Barbara Massau if you think you belong to this little group! Following our appeal for tombola prizes in our Autumn newsletter, we are delighted to say that the response was excellent. We now have a very tempting tombola for the Gala weekend and wish to thank all those who donated a gift(s) for their generosity. Please pay a visit to our stand at Bridgnorth on Saturday or Sunday to see what can be won and help 82045 along at the same time. Chris's 1949 lowlight Morris Minor peeps out from behind a display of patterns on show outside his garage. The patterns and coreboxes, all made by Brian, include firebox support bracket, horn guides and horn block. The "Moggy" had already been on the road for three years when the first of the 82XXX tanks entered service - quite a thought! The first of the stretchers attached to the frames. Buffer beam gussets in place too.